Daniel R. Porterfield, Ph.D., addresses the crowd after the presidential announcement in Mayser Gymnasium. To view a video of Franklin & Marshall’s presidential announcement, click here. In a special gathering of the Franklin & Marshall community this morning in Mayser Gymnasium, Chair of the Board of Trustees Larry Bonchek, M.D., P’91 announced that the Board has elected Daniel R. Porterfield, Ph.D., as the College’s 15th president. 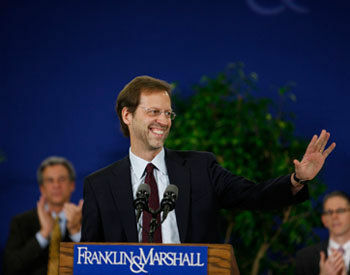 Porterfield, senior vice president for strategic development at Georgetown University, will assume leadership of Franklin & Marshall on March 1, 2011. Joined on stage by F&M’s Presidential Search Committee and its chair, Trustee Sue Washburn ’73, Bonchek said that the task of searching for a new president ended much earlier than anticipated. Porterfield has wide-ranging responsibility at Georgetown, including oversight of communications, government relations, community relations, civic engagement, social impact strategy and intercollegiate athletics. A recipient of a Rhodes Scholarship and a Mellon Fellowship in the Humanities, he earned his Ph.D. in English from The Graduate Center of The City University of New York. He obtained a bachelor’s degree in English from Georgetown, and subsequently earned a second bachelor’s degree in English from Hertford College at Oxford University. Porterfield succeeds John Fry, who became president of Drexel University on July 1. John F. Burness ’67 will continue to serve as interim president until Porterfield begins his official duties. Following Bonchek’s announcement and an introduction by Washburn, Porterfield received an extended standing ovation. He then addressed the crowd in Mayser. “This community is known for striving students, brilliant scholar-teachers, traditions of faculty governance, shared responsibility, professionalism, civility, administrative excellence, alumni engagement and collective self-government that I honor in joining you,” Porterfield said. An assistant professor of English at Georgetown since 1997, Porterfield regularly teaches literature courses dealing with human rights, education and social justice. He and his family have lived in a residence hall on campus for more than seven years, and he is active in campus culture and life. Prior to coming to Georgetown in 1997, he served for four years as a senior aide to U.S. Health and Human Services Secretary Donna E. Shalala. A native of Baltimore, Porterfield is married to Karen A. Herrling, an advocacy attorney in state and local enforcement of immigrant rights. They have three school-age children and live in a residence hall on Georgetown’s campus. For more information on Porterfield, see his biography on the website of the president-elect. F&M’s Presidential Search Committee, comprising trustees, faculty members, students and professional staff, began the search for the College’s next president last spring. While the committee evaluated a pool of high-quality candidates, Washburn says Porterfield stood out as the person whose leadership is right for F&M now. Members of the campus community who attended Tuesday’s announcement left with positive impressions of the College’s president-elect. Nicole Morano ’11 and Lilah Thompson ’11, both English majors, were excited to learn that Porterfield has a background in their field. Read more reaction from members of the F&M community here, and also in the Nov. 18 edition of The Diplomat.